How To CONTROL the New Instagram Algorithm? A few weeks ago we did a poll in our Insta Stories and asked if you feel stressed about posting on Instagram. And guess what? 90% of you answered YES. 90% (!!). The Instagram algorithm is not conspiring against you to make your life harder. I swear. It’s trying to help you (even though it might not seem like it). But for the algorithm to help you, you need to help it first. The algorithm needs to understand you. Once it understands you, it will work for you. It will help you grow your account, have more likes, comments and awesome followers who actually care about what you post. So YES. 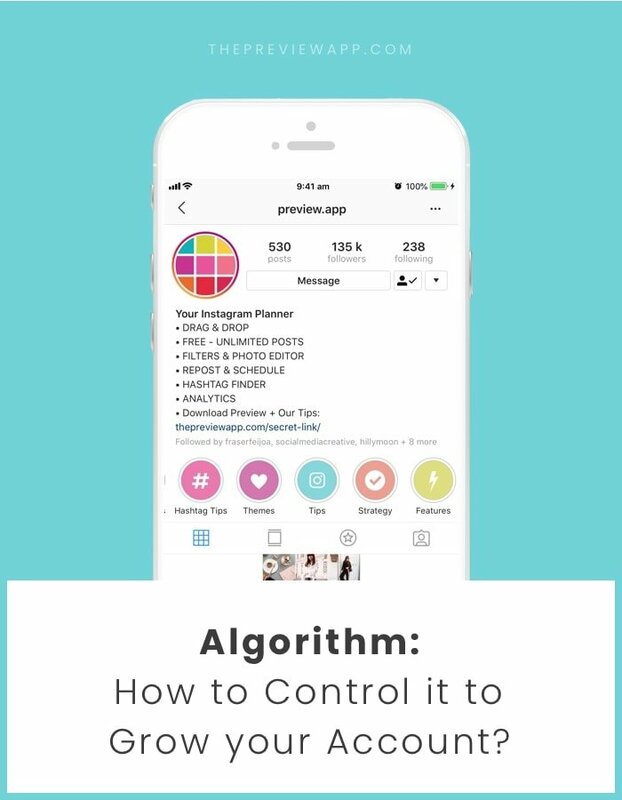 You can control the Instagram algorithm. How? Do these 6 things. It is a very simple tip I know, but it is so important. You need to show Instagram that you are active / alive. One way to do that is by using its features. The more you use the app and its features, the more Instagram will like you and promote you. It makes sense, right? Don’t forget about people who are already following you. They already pressed the “follow” button for you. Now you just have to interact with them. 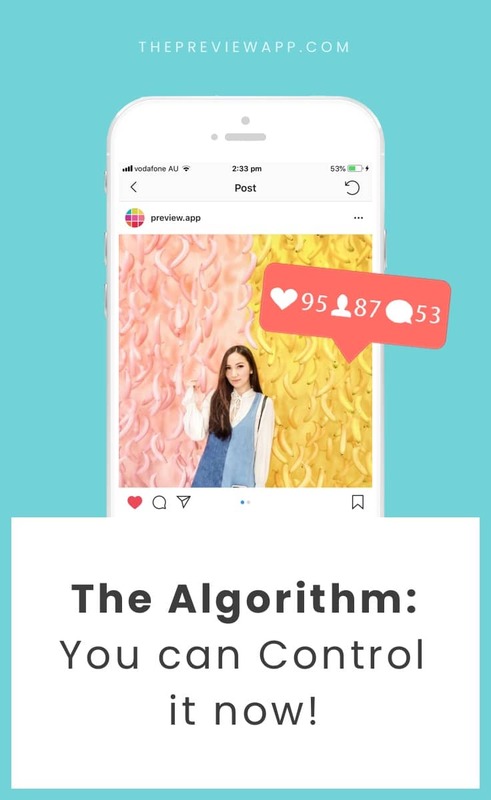 The more you interact with them = the more the algorithm will show your posts in their home feed. It might not be physically possible to look at everyone’s account. And that’s ok. Take a few minutes every day to look at some people who are liking and commenting on your posts, and return the favor. You should interact more than you post. This tip will transform your Instagram! Interact with other people who are OUTSIDE of your account (but not just any, random account – see the next tip). Search for a hashtag that is relevant to your account (#yogalover) and take the time to like and comment on other people’s photos. These 3 things directly affect who Instagram is going to link you to. If you have a yoga account but you like dog photos ALL.THE.TIME Instagram is going to link you to dog accounts… not ideal if you want to reach fellow yoga lovers. Do you understand what I mean? I recommend you take some time to like and comment on accounts that you want to be related to. So if you have a yoga account, search for #yogalover (for example) and make new friends. The algorithm will learn what kind of people you like. It also will learn who it should show your posts to. Like I just mentioned, the hashtags you use influence the algorithm. I already wrote a blog post about how to use Instagram hashtags. I showed you how to select the best hashtags for your account. If you have a shop and you are selling pens, not many people will go out of their way to type “#pen” on Instagram. Think about who are the people who need your stationary (#entrepreneurs, #girlboss #creativecommunity). The algorithm will understand who you are trying to connect with and they will show your posts to more relevant people. And the last tip is to be consistent. Did you notice that when you disappear from Instagram for a loooong time (more than 3 days), you don’t get that much engagement anymore? Well, it looks like if you disappear for too long Instagram forgets you a little. The trick is to stay active on Instagram. It can become stressful but it really doesn’t have to be. One easy trick is to get into a routine and plan your feed is advance (hello Preview app). Take a few hours to plan your feed a week in advance and let the stress meeeeelt off. Do that for a week or two and you’ll see how the algorithm will start changing. Your Explore feed will change (you will see more relevant content) and you will see that people will come back more often to see your new posts. Please don’t stress out. Have fun!